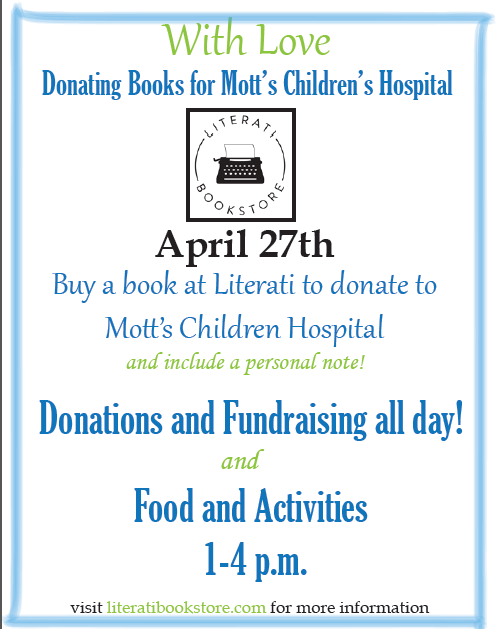 Sunday, April 27th Literati Bookstore will be hosting a charity event for people to come in and buy books or donate funds for the patients and families of Mott’s Children’s Hospital. Donators can buy children’s or adult’s books or donate money towards the purchase of books. Those who donate can write a note inside to the children and families that will be reading the books! There will be desserts and activities for those who come in the afternoon. University of Michigan students will be hosting the event. The student group is devoted to keeping the love of literature alive. They want to share their love with all those who are able to donate and with the patients and families of Mott’s Children’s Hospital. Donations will be taken all day during Literati’s regular hours of operation, 10 a.m. to 7 p.m. and desserts and activities will be held from 1 p.m. to 4 p.m. Stop by to show some support and share some love! We are so excited to be hosting the With Love event in just over a week. It’s been a long journey, but we are finally here and we cannot wait to celebrate and spread some love at Literati Bookstore at 124 E. Washington. Come support an amazing local establishment while donating to a great cause. Just imagine the expression on the faces of the children and their family members who open up the cover of a brand new book and find an unexpected note from you!